Lily's Ink Pad: Happy New Year! Hope all is happy with you all! I am happily stamping and designing away in my stamp room. I'd be happier if it wasn't getting cold in here. That new window doesn't seem to be doing it's job tonight as the temperature dips below zero! Bubba and Don went on a trip. According to Don, they are living the high life! Ron and I are here. Ron made it all the way to 7:50 tonight. I am still going. How? 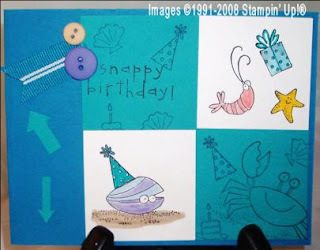 --A Splitcoast Stampers Challenge Night! Each hour a new challenge is posted. I am going to show you a few of what I accomplished. I am finding the challenges fun! 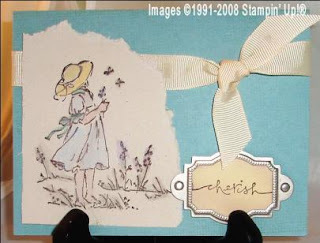 My goal was to create samples for my upcoming retiring stamp camp, so I am going to show you those ideas...You may or may not see them in my upcoming events! Here's my first one. Yeah, I know, not exactly me! It was for challenge SCSNYE04: The 7 P's. 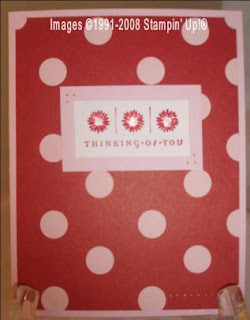 I was supposed to include these 7 P's: Piercing, Patterned Paper, Paper Piecing, Polka-Dot,Pink Punches, Pop-Dots. I don't know if you can tell or not, but I added microbeads to the centers of the flowers for added fun. This picture is really bad. The actual card is neater. If you look closely, you can see that I used a large heart in versamark on the black for a little texture. On my photo, it looks like areas of glare. This challenge was SCSNYE07 : A Black Tie Affair (challenges 05, 06 were with new stuff, so you can't see it yet). The challenge was to use Black, White, and Silver or Gold--black tie style. This was perfect for me as Bubba's Raider Fan-ness has made me grown fond of this color combination! 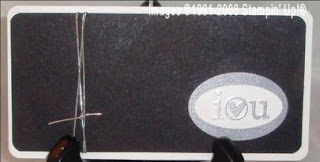 I embossed the "I heart you", which made it so cool! I rarely emboss anymore, so this was a great reminder of all the stuff I do own! Not the Stamping, but the challenge itself. SCSNYE08 was titled "1.1.2009" and was based on the numbers in the date: 1 inch of ribbon, 1 punch used, 2 brads, eyelets, or buttons, 0 glitter, 0 embossing, and 9 cardstock colors to choose from:Real Red, Pacific Point, Pixie Pink, Take with Teal, Chocolate Chip, Cameo Coral, Pink Pirouette, Kiwi Kiss, Sage Shadow. The planning took the longest. I started with my color choices and stamp set and went from there. The arrows and the ribbon aren't how I usually embellish cards and I'm not happy with it, but I wanted to live by the rules! The final card I am going to show you is really a flashback. The idea was to create a tribute to a friend, "something that would make them smile." This was one of the first stamps sets I ever bought. Remember, Bonnie? I rarely use it anymore because I have trouble determining what to do. This time, I used my watercolor wonder crayons. It was fun. By the way, the stamp sets I used tonight are retiring! If you want them get them by January 18th! The exception is a Happy Heart, which is in the Holiday Mini Catalog, available until January 31. Love this Stamp Set and Punch! Make Your Own Gift Box! Retiring Stamps List is Out!